- Non-stop monitoring Twitter, Facebook, Google Plus, blogs, forums, news blogs, and other online resources for keywords. - Notifying you when new mentions appear with daily or weekly emails about the latest posts. - Prioritizing mentions by their popularity, enabling you to identify people who influence opinions about your brand category the most. - Engage with your customers in real time: optimize customer service by always being there for your customers. - Build relationships with niche influencers: easily identify key influencers by the popularity of their posts, and reach out to them. - Raise brand awareness: reach more people through monitoring mentions of niche-related keywords and joining online conversations. - Find new sales opportunities: offer your product to people asking online about your product category. - Monitor your competitors: be aware of the successes and mistakes of your competitors to optimize your own business strategies. - Our built-in and user-friendly browser lets you react to mentions instantly. - Dashboard is easily accessed from any device (your phone, tablet, desktop, or laptop). 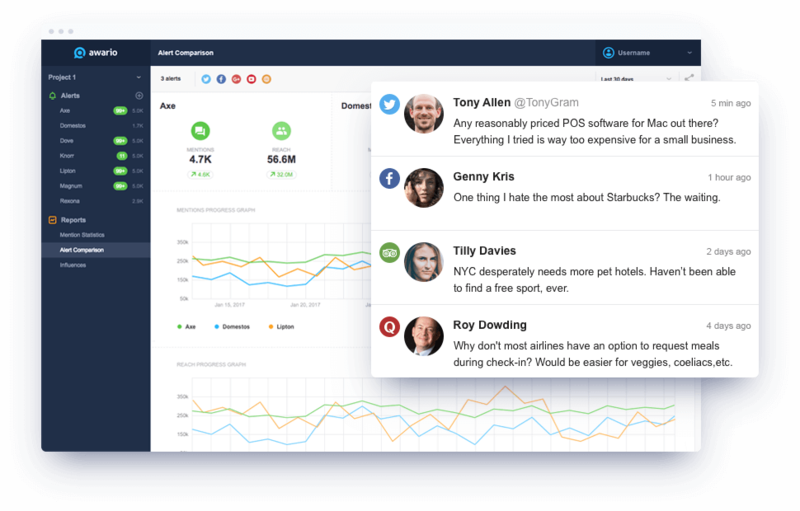 Log in to see the latest mentions wherever you are and react to them in time. SMM, social media marketing, brand monitoring, mentions, social media activity, web monitoring AWARIO tracks online mentions of your brand, product, competitors or any given keyword. It helps you engage with your customers, increase brand awareness, and find new sales opportunities online through reacting to mentions in real time.